I used the Hicksville parking facility this past week, which I rarely do. I'm glad I did, because now I have a story to tell you. 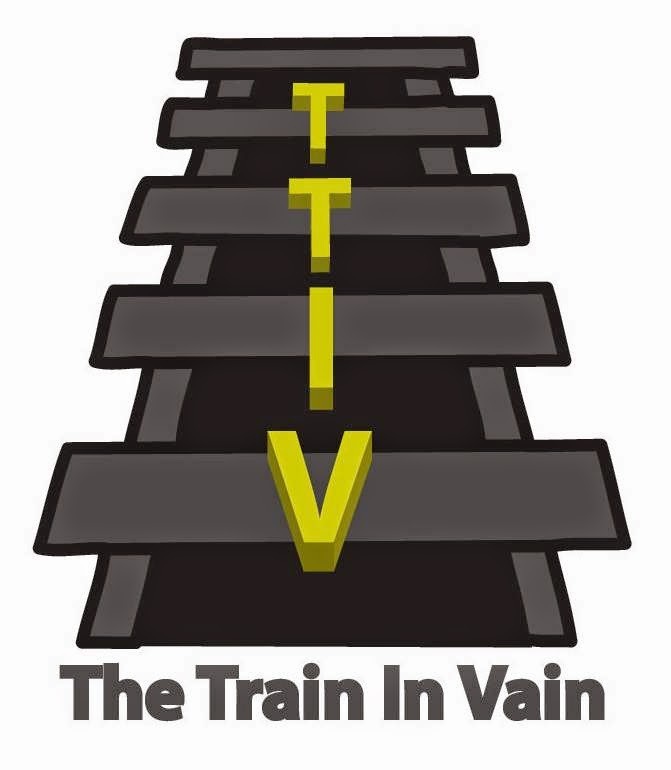 Regular TTIV readers will remember the headache I'm going to talk about, which is dealing with the traffic director. I like to call him Edgar the rental cop, or "Edgar Wrentilkoppe." For those of you who aren't familiar with him, he was first introduced in this post. 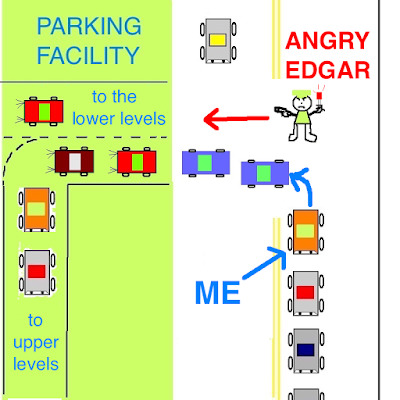 Once again, Edgar's traffic directing skills amused me. This one's going to involve crudely drawn visual aids. Let's get right to the story. Have a look at Exhibit A. The parking facility is shown in puke green. The entrance is on Duffy Avenue, a block away from Hicksville station. When you pull into the garage, you are met with two roadways. If you stay to the right, you are taken to the two lower parking levels. 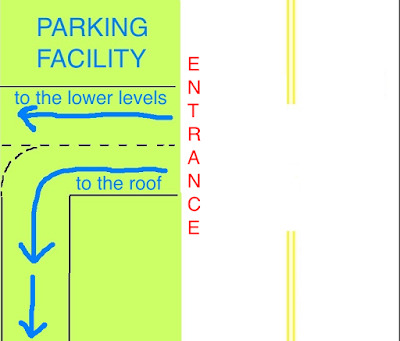 If you stay to the left, you'll find parking at grade level and then up on the roof. The upper level is the best place to park because it's then easy to get out of the garage. Down the ramp and out. Couldn't be simpler. I approach the facility from the east, or in terms of Exhibit A, from the bottom up. Therefore, I need to make a left turn into the lot. If I want to park on the roof, I need to stay to the left. This is where the fun with Edgar begins. Take a look at Exhibit B, which is Exhibit A plus all the action. At the facility entrance, the right lane to the lower levels was clear. The left lane to the upper level was backed up into the street. 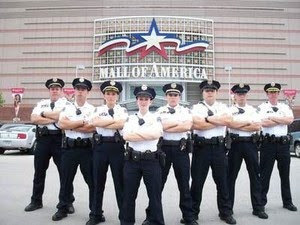 Where was TTIV in this? There is a vehicle labeled "ME" in Exhibit B. There was nowhere to go if I wanted to park on the upper level. I stood there waiting for clearance so I could make the left turn. 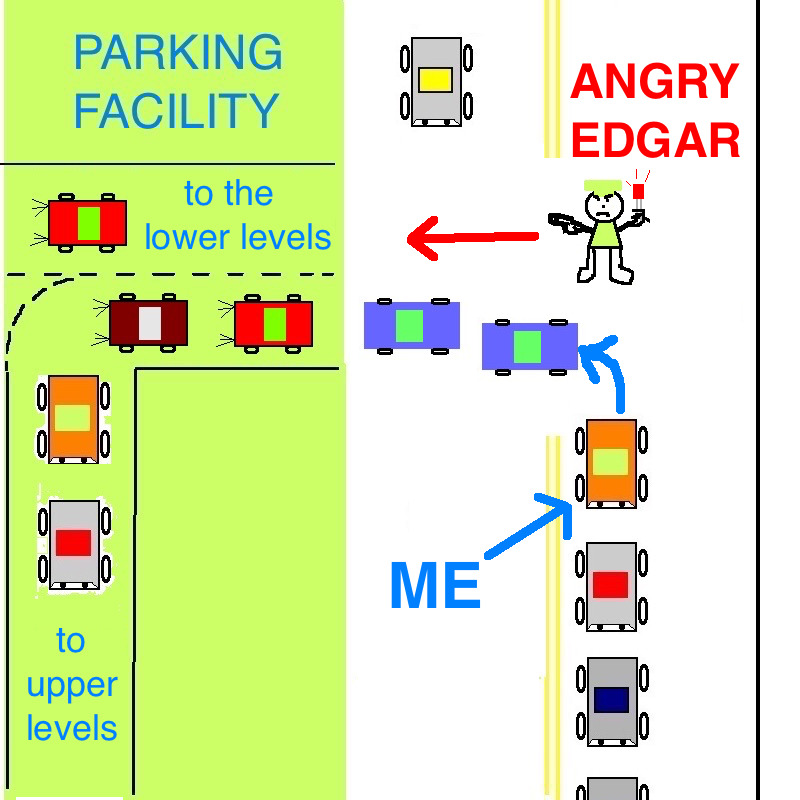 My inaction agitated Edgar greatly. He's up on the top right of Exhibit B. He eyed me aggressively, and gestured menacingly to the lower level lane. I pointed to the left, upper level lane, to let him know that I was going that way. The show of my intentions did not placate Edgar in the slightest. He again gestured menacingly to the lower level lane. I considered lowering my window to explain, but Edgar doesn't respond to reason. In a recent post, I explained how he screamed at me to keep moving when a pedestrian blocked my way. There was no use, so I ignored him. Five seconds later, the space cleared and I was on my way. I don't think Edgar is cut out for this rental cop business. His anger issues may wreak havoc on his health. He might want to try a different career path. But what? If I were counseling him, I'd rule out group therapy leader, middle school guidance counselor, and social worker. As an angry person with minimal people skills, he'd be an excellent fit for a career in airline customer service. I think he would be a great motivator as a fitness instructor. He could wear his little vest and wave his orange baton until you finish 100 sit-ups. Plus I have personally seen him run after cars who disobey him so he must hold the world record in sprinting. Wow! I've never seen Edgar chase people. He should have a washboard stomach and rippling muscles given all the exercise he gets. Tell me more (either here in the comments or via private message) about what you've seen him do! This sounds like a guest post in waiting.